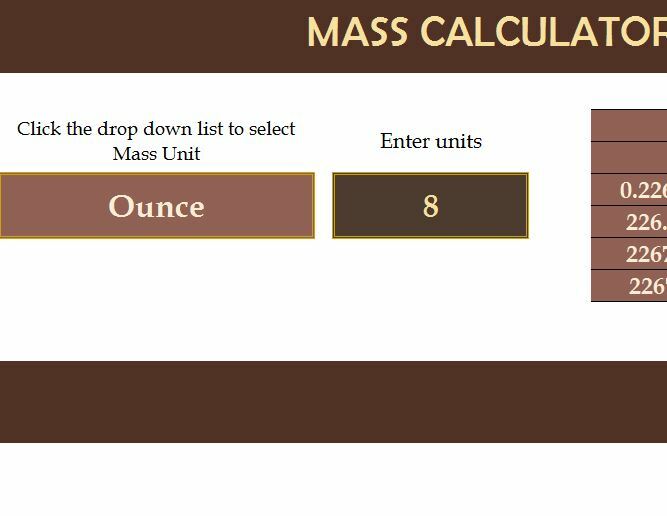 If you need a quick and simple way to calculate the different units of measure for mass, the Mass Calculator Template is your new best friend. This free document allows you to enter the important information required for conversion and gives you the calculated results in an instant. Best of all, the conversion template is 100% free to download and use, no more hassle with tedious calculations that only waste time and distract you from the task at hand. You can read more about this template and download it for free by reading the set of instructions given below. After successfully downloading the template to your computer by following the link given at the bottom of this page, you will be free to start customizing the sheet to your liking. The template itself is comprised of a single page and you only need to enter two variables to complete the template to make things easy. The first thing that you need to enter is the actual unit of measure you want to convert from to get another. Let’s say you want to convert 8 ounces into pounds because you’re baking a cake and the recipe calls for 8 ounces but the packaging for the butter shows up in pounds. You would simply enter “Ounce” in the drop-down menu of the first cell and “8” in the next cell over. You will see a list of different units in the table to the right of the page. You would simply find the “Pound” cell and look at the figure next to it. You then know you need half a pound of butter to make your cake. Easy to enter your information. Calculations are done for you.